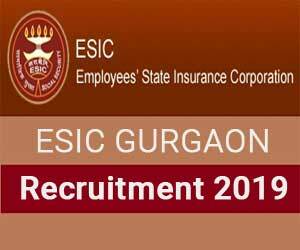 New Delhi: The Employees’ State Insurance Corporation, Gurugram (ESIC Gurugram) released 10 Vacancies for Senior Resident post on Contractual Basis. The Selection will be done on the basis of Walk-in-interview. Date & Time of interview: 11th April 2019 (Thursday) at 09:00 AM. Venue: ESIC Model Hospital, Sector 9A, Gurgaon, Haryana 122001. The Vacancies are in the Department of Obstetrics & Gynaecology, Casualty, Surgery, Pediatrics, General Medicine. Qualification: MBBS with Post Graduate degree/diploma in concerned specialty from a recognized university. Age: Not exceeding 37 years as on date of interview (Relaxation for SC/ST/OBC/PH/Ex-Serviceman as per rules). 1. The candidates must bring original documents for verification at 9:00 AM sharp on the date of interview. 3. Application fee submitted by the candidate is non-refundable. 5. The Medical Superintendent reserves the right to alter the date or cancel the interview. 6. At the time of joining selected candidates will have to sign “AGREEMENT” as per ESIC norms and the cost of stamp paper of Rs.100/- for “Agreement” will be borne by the candidate. 1. The eligible and desirous candidates, along with their application filled properly in prescribed Performa “Annexure-A” should appear for a walk-in-interview with application. 2. The candidates must bring original documents for verification at 9:00 AM sharp on the date of interview. No TA/DA will be paid to candidates for appearing in the walk-in-interview. 6. At the time Of joining selected candidates will have to sign “AGREEMENT” as per ESIC norms and the cost of stamp paper of Rs. 100/- for “Agreement” will be borne by the candidate.